I love slugs. I had pet slugs as a kid, and I still remember holding my finger still to see what would happen as a slug delicately rasped at my finger with its radula. We have a large number of slugs, both at the proto-farm and at our plot in the community garden, and they have been much on my mind. Permaculture teaches that “The problem is the solution”, but it’s up to me to figure out how to apply the solution. Do all slugs do the same kind of damage to seedlings? Do some focus on breaking down dead plant matter, while others focus on tender lettuces? What if we allowed slugs to do our thinning for us (or planted twice as much), instead of composting all those tiny little extra plants? What if slug poop is some kind of magical substance that helps soil to glow with life? 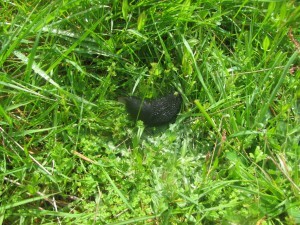 I’m going to be watching slugs, this year. I’m going to see what they take out (all my cucumbers! ), and what they leave. I may do a trial bed next year, with heavy slug control on one side and light control on the other, to see if slug poop is a miracle fertilizer. Anyone have any ways that slugs have helped them in the garden, besides being duck-food? Previous PostFirst work party!Next PostThings are ticking along. I heard a story about a summer reskilling camp where kids stalked, caught, cooked and ate slugs. Apparently they “tasted like chicken”.